Text by Ralph Rugoff, Laura Hoptman, Will Self, David Means, and Salman Rushdie. 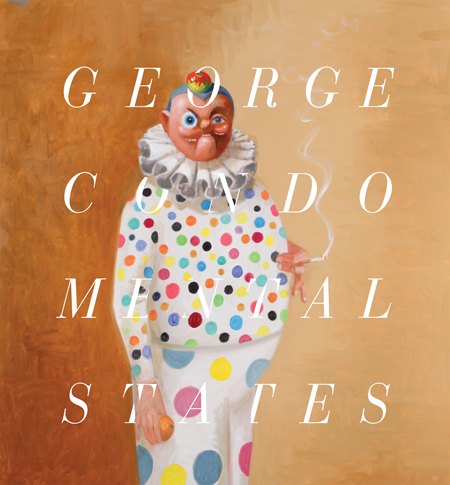 This catalogue is publish in conjunction with the exhibition, "George Condo: Mental States." The American artist George Condo made a splash in New York in the early 1980s with a line of surrealist-style figure paintings. It was tasty, erudite stuff, freaky but classy, a Mixmaster version of old master, with a big glop of Pop tossed in. Then he went to Europe, found an avid audience and stayed for a decade, mostly in Paris. To the New York art world, myopic and memoryless, he might have moved to Mars. In 1995 he resettled in Manhattan, and has been there since, producing at high volume and exhibiting prominently without generating the kind of main-stage mojo that has made a younger artist like John Currin — who is hugely indebted to Mr. Condo’s example — a star. But now, finally, and with minimum fanfare, he’s having his first institutional career survey here. 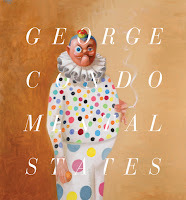 It’s titled “George Condo: Mental States.” It’s at the New Museum. And it’s sensational. It demonstrates, among other things, what anyone who has tracked his career already knows. He’s the missing link, or one of them (Carroll Dunham is another), between an older tradition of fiercely loony American figure painting — Willem de Kooning’s grinning women, Philip Guston’s ground-meat guys, Jim Nutt’s cubist cuties, anything by Peter Saul — and the recent and updated resurgence of that tradition in the work of Mr. Currin, Glenn Brown, Nicole Eisenman, Dana Schutz and others. Not that Mr. Condo — born in 1957 in New Hampshire — requires historical positioning to justify a survey. One glance at the installation of about 50 of his mainly fictional portraits on the New Museum’s fourth floor tells you otherwise. Some of the paintings are stronger and stranger than others. But covering a long wall up to the ceiling, with no two images alike, they add up to a tour de force of stylistic multitasking and figurative variety. Your first instinct is to spot sources for those styles and figures: Picasso, Arcimboldo, Cookie Monster, Goya, Looney Tunes. 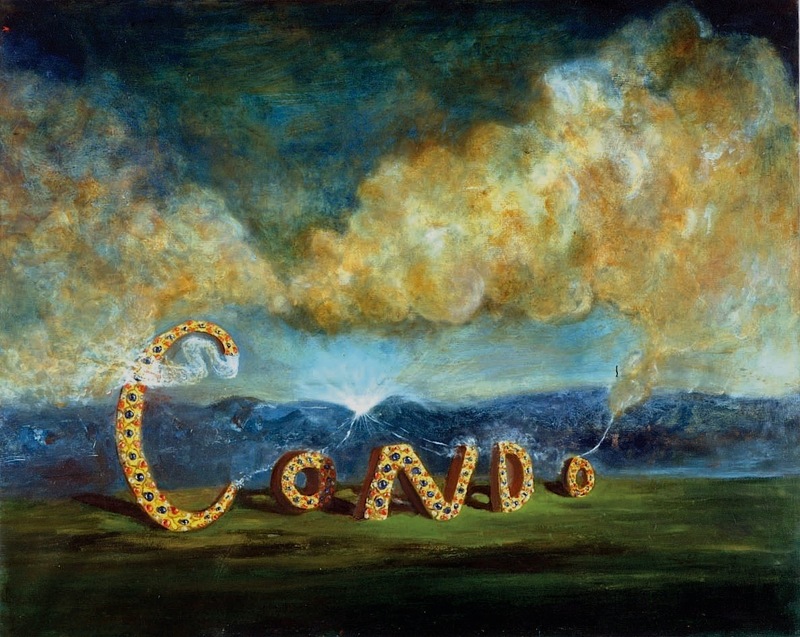 But you only go so far with this because Mr. Condo isn’t much into wholesale appropriation. He’s interested in invention. Everything is pretty much straight from his brain. The earliest picture in the show, “The Madonna,” dates from 1982 and gives a basic sense of how Mr. Condo works. He painted his subject, a Renaissance staple, straightforwardly, then did something funny to it. He scraped some paint away so that the face became blurred and slightly separated from the head, like a slipping mask. This subtle effect turned a historically and ideologically loaded subject into contemporary caprice, though without taking the history and ideas away. They’re here, but detached, like the Madonna’s face. Even after being messed around with, she looks fairly normal, which cannot be said of most of the figures surrounding her. These include other quasi-religious images — Mr. Condo grew up as a Roman Catholic — including a Mary Magdalene with bared breasts and sticking-out rodent ears. Taken as an icon it’s deeply bizarre, yet it doesn’t feel entirely irreverent, which makes it even odder. Various gods of art history get their due and take their licks. The 1994 “Memories of Rembrandt” borrows the tawny palette of that Dutch artist’s late self-portraits but reduces his facial features to a juicy stew of eyeballs and chunks of flesh. Throughout the show pieces of Picasso are everywhere, puzzled together, piled up like kindling, broken up, gnawed on, inserted wherever there’s room. Mr. Condo clearly can’t get enough of him. News photographs of public personalities have served as models for portraits, and occasionally he leaves these people looking more or less like themselves, as he did a few years back in a series of 15 portraits of Elizabeth II of Britain. One of these images at the New Museum, “The Insane Queen,” is, in its zany way, almost respectful of her. Others — the queen with a detachable chin, a clown smile, a carrot stuck through her head — are not, and landed Mr. Condo in hot water when he brought them to the Tate Modern. A few paintings, and several gilded bronze heads in the show, are named for characters — “The Barber,” “The Butler,” “The Alcoholic” — in Mr. Condo’s private mythology of cultural types. And then there are portraits that are just mysterious hallucinations, floating free and unrooted. In “Red Antipodular Portrait” a bug-eyed creature stares out apprehensively from behind cascades of scarlet fur. A kind of Bichon Maltese-Yosemite Sam hybrid, it exists in a one-species universe, unconnected to art or life or history. Yet it gives the impression of having feelings, so it evokes a complicated response: amusement with a tug of empathy. Isn’t empathy going too far? Isn’t this picture just a cartoon? Within the world of Mr. Condo’s portraits, nothing is “just” anything. The exhibition continues on the museum’s third floor with groups of nonportrait paintings in which the content tends to be at least obliquely topical and emotions forcefully projected. Much of the work dates from after 9/11; some of it alludes to recent Wall Street scandals. The prevailing mood shifts between confused sadness and suppressed anger. In a small gallery labeled “Melancholia” male-and-female couples with tiny batlike faces, like the pair in “The Stockbroker,” pose in embattled silence. A black-suited executive stands beneath a suspended carrot, once a lure, now a sword of Damocles. Jesus appears. Child size, dwarfed by darkness, he’s a little mound of raw matter with rodent teeth, startled eyes and flowers — or maybe thorns — laced through his stringy hair. The adjoining gallery, with the theme of “Manic Society,” has the opposite kind of energy, clamorous and violent. Copulating lovers snarl like beasts; a priest with a Francis Bacon mouth lets out a scream. In an extraordinary painting called “Uncle Joe” a hirsute man with a demonic smile relaxes with a cigarette and a bottle of wine on a patch of grass, unaware that he’s at the edge of a precipice. In its third and last room a show of many surprises concludes with yet another one: a sampling of the abstract painting that Mr. Condo has been doing almost since he career began. His version of abstraction bears the same relationship to the traditional nonobjective thing as his portraits do to conventional portraiture. It’s different, but if it’s interesting, who cares? “Dancing to Miles” and “Internal Constellation” look, from a distance, like exercises in nuanced color and tone. But as you come closer, intricate, all-over networks of imagery come into focus: popping eyes, open mouths, breasts, hands, heads, all recognizable from the portraits. The patterns are so detailed and attention demanding as to be exhausting. Two paintings from 2010 with larger, cubistic forms are easier to see, but they’re too Picassoid for comfort. They smudge a fine line between emulation and imitation, always a danger for artists who have a naturally ventriloqual grasp of styles. The miracle is that Mr. Condo doesn’t succumb to imitation more often, or doesn’t in this survey, which has been scrupulously selected and edited by Ralph Rugoff, director of the Hayward Gallery in London, and Laura Hoptman, a former senior curator at the New Museum and now at the Museum of Modern Art. They are also responsible for a superlative installation, one that demonstrates, for the first time, that there are ways to exhibit painting effectively in this museum’s high, tight, object-squelching spaces. But much of that effectiveness can be attributed to the artist they’re dealing with. Mr. Condo is not a producer of single precious items consistent in style and long in the making. If that’s what you want from painting, he’ll disappoint you. He’s an artist of variety, plentitude and multiformity. He needs to be seen in an environment that presents him not as a virtuoso soloist but as the master of the massed chorale, and that’s what Mr. Rugoff and Ms. Hoptman have done.